by Virginia Bruce with Karen Munday, Audubon Urban Wildlife Resource Office. We found our little dog Taffy’s body in the woods on the lot next to us, six years ago on Mothers’ Day morning. But we don’t blame the coyotes; we were the ones who didn’t go get her after someone left the gate open. We’d heard that coyotes were a threat, we just didn’t think it would happen to us. As people fill the hills and valley of Cedar Mill with houses, these truly wily critters have learned to fit in between the cracks in our controlled environment. We love the wooded hills and natural creeks of our community, and land use regulations increasingly mandate leaving natural corridors when	land is developed. Coyotes are intelligent and adaptible animals that despite more than 100 years of intensive control measures have increased in number and expanded their range. They are omnivorous, and they do extremely well on the fringes of urban and suburban areas living on a diet that includes small rodents and rabbits, garden vegetables and fruit, garbage and the occasional free-roaming cat or small dog. So we have a growing coyote population, according to Bud Weaver, USDA APHIS (Animal and Plant Inspection Service) agent in Washington County. “When I started fifteen years ago the average litter was 4-7 pups, with maybe 1/3 surviving. Now you get 7-14 pups, and 2/3 of them making it because they have a better food source,” he tells me. Weaver is called when city and county agencies get complaints from citizens. Many urban residents believe that live-trapping and relocation of wild animals isa “win-win” situation. But unless you remove what brought the coyotes in, others will quickly move in. Sometimes they trap animals. “Coyotes won’t go into cage-type traps,” says Weaver. “We have steel traps and cable snares that are 100% more humane than the old ones.” But of course the trapped animals have to be euthanized, either by shooting, by drugs administered by a vet, by CO2 or bludgeoning. So the end result of our carelessness and refusal to change our habits is a burgeoning population that we try to annihilate. And every unwary animal	that is killed makes the overall population that much more wily. When someone calls Rick Boatner’s office with a complaint, he gives them “advice about living with it.” Boatner, Assistant District Wildlife Biologist with Oregon’s Department of Fish and Wildlife, can provide a packet of literature, but mainly he talks to people about their situation and offers practical advice on sharing a neighborhood with wildlife. If the person is unsuccessful solving the problem, Boatner can issue a permit to trap the animal so it can be euthanized. He also refers homeowners to contractors who will get rid of animals. Coyotes will typically maintain a safe distance, but are curious and will not always run from humans. Humans are not the size of coyote prey. 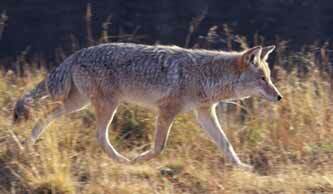 Although their bushy coat makes them look larger most coyotes weigh around 25-30 pounds. There has only been one human death attributed to coyote predation during the entire history of the United States, when a coyote that had been deliberately	habituated to human handouts preyed upon his human feeder’s three-year-old child. In Oregon, there is only one documented attack on record and that was a situation in which a man was bitten while attempting to beat a cornered coyote to death with a 2x4. To prevent coyotes from entering your yard consider removing unnecessary brush , installing a motion-sensitive lighting system, or installing a coyote proof fence. To be effective fences must be at least six feet tall, have no openings greater than four inches and should extend flush with the	ground. Coyotes have been known to climb chain link fences. Cover garbage cans and compost bins tightly and feed pets indoors. Remove fallen fruit from yards. Keep house cats indoors (especially at night). Supervise dogs when outdoors or keep them in a fenced backyard. Always keep dogs on a leash when	visiting	a natural area. Teach children to enjoy wildlife from a distance but not to approach or handle wild animals. Never attempt to capture or tame a wild animal. Never deliberately feed any wild animals (other than songbird feeders). Feeding habituates wild animals to human handouts, causes them to lose their instinctual fear of humans and leads to unnaturally large and unsustainable local populations of some species. If you want to encourage wildlife, consider naturescaping which provides food and shelter to native species. If you have a conflict with a wild animal, see www.audubonportland.org/wild/index.html; contact the Audubon Society of Portland Urban Wildlife Resource Office for	advice (503) 292-0304, or contact the Oregon Department of Fish and Wildlife at 503-621-3488.